We’re also offering a special incentive for you if you refer a friend to the clinic. Once they book up and visit us we’ll send you a Marks & Spencer’s voucher! So get spreading the word and claim your special gift today. We’ve also started to give our patients birthday treats so keep an eye out in your email inbox for yours when the time’s right. You may have noticed that diabetes and foot health have been hitting the headlines again over the last few weeks. The charity Diabetes UK has launched a ‘Putting Feet First’ campaign focused on helping people with diabetes look after their feet. This follows the findings of a survey by the charity that found that almost a third of people (32 per cent) in the north west of England alone were unaware of the dangers of diabetes-related foot ulcers, despite being a leading cause of amputations. Check out our top tips below. If you’d like to have a consultation to check your feet over thoroughly give us a call on 0191 2618375 to make an appointment. We announced last month that our latest training involved us travelling to Liverpool to undergo training for our new Optigate treatment (see photos above). The day went very well and we’re delighted that the service is now fully up and running. This state of the art system helps to measure irregularities in the way you walk and run, and helps us identify the cause of your foot pain. Evelyn Mcgee will also be flying off to Ireland soon to undergo training on the Shockwave Therapy, which is a specialist treatment for chronic and painful musculoskeletal conditions. By passing a very low energy shockwave through the affected area, it helps in initiating a healing response. Here at the clinic, we’ve produced excellent results in alleviating pain and accelerating the healing process in patients who have chronic conditions that have not responded to conventional treatments. The renovations in the clinic are just about finished as you can see in the photographs below! We’ve been busy decorating and having LED lighting installed, a new wi fi system and a new water cooler. We’re really pleased with the end result and hope you like it as much as we do! Oh, and our podiatrists Craig Burton and Scott Walton both enjoyed their birthday in recent weeks – please do join us in sending them both our very best wishes! 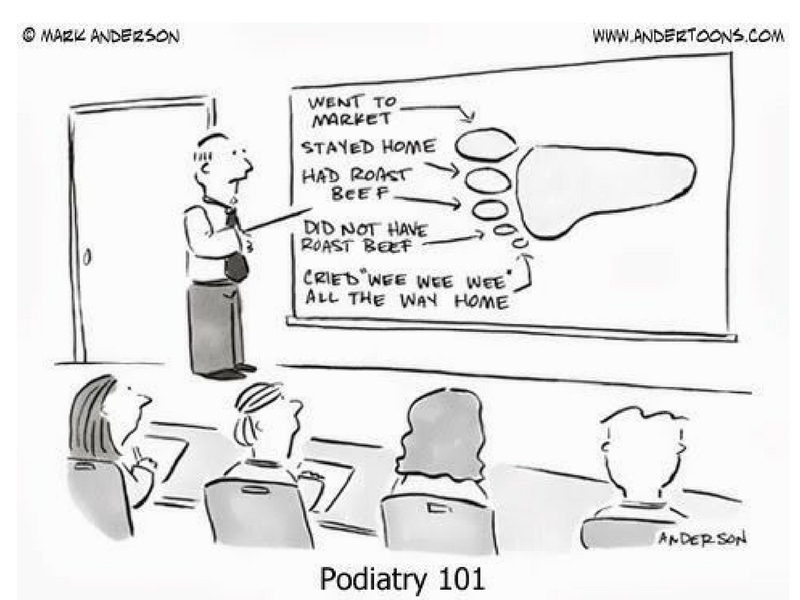 To make an appointment with any of our podiatrists just give us a call on 0191 2618375. If you have diabetes you’re at much greater risk of developing problems with your feet. This is because of the damage that raised blood sugars can cause to sensation and circulation. This can mean foot injuries do not heal well, and you may not notice if your foot is sore or injured. If left untreated, these problems can cause foot ulcers and infections and, at worst, may lead to amputations. Don’t walk barefoot, especially in the garden or on the beach on holidays to avoid cuts. Try to avoid sitting with your legs crossed so you don't constrict your blood circulation. It's an old one but a good one! Our main goal is to make your feet happy and providing you with the best quality service possible. We love this patient testimonial. "I have been going to Newcastle Foot Clinic for years and, as a diabetic, it is important to look after my feet. Craig is an excellent podiatrist and I trust him to look after my feet."